In the near future, I plan to introduce two bills that would help the bottom line of many volunteer fire and ambulance companies in Pennsylvania by distributing state funding more fairly. One of my proposals would ensure that a certain number of these organizations are prioritized when local share grants from expanded gaming are awarded. The bill would require that those grants go to fire and ambulance companies that do not already receive local share funding generated by the gaming proceeds from a casino in the same county. By doing this, there would be a more equitable distribution of those gaming dollars to fire and ambulance companies across the Commonwealth. The second bill I plan to introduce would state that a fire company is not eligible for a loan under the Volunteer Loan Assistance Program (VLAP) if that company already receives local share funding from a casino in the same county. It is only fair that the money available in the VLAP should be reserved for fire companies lacking strong financial support so they can maintain their apparatus and equipment. Under Act 42 of 2017, several new forms of gambling were legalized in Pennsylvania. Three of them: iGaming, sports betting and video gaming terminals, created three new local share grant accounts. 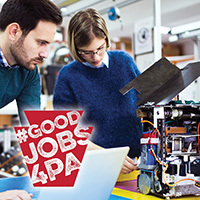 House Republicans launched the #GoodJobs4PA initiative this week, focusing on efforts to enhance our workforce development system to help students, under-employed and unemployed adults, as well as returning military veterans and others enter fulfilling, family-sustaining careers. House Bill 265, which would expand the online database that allows students and potential students to plan where courses, programs, certificates and diplomas transfer among public schools and institutions of higher education. House Bill 297, which would direct the State Department of Education to develop materials outlining workforce needs, including training opportunities and future earning potential. House Bill 334, which would expedite the approval of important educational programs to respond better to industry and workforce demands. House Bill 393 (to be introduced soon), which would create an online career resource center. House Bill 394 (to be introduced soon), which would require the Pennsylvania Department of Education to inventory workforce development programs offered at secondary and postsecondary institutions. House Bill 395 (to be introduced soon), which would require CTE programs to establish occupational advisory committees. House Bill 396 (to be introduced soon), which would add at least one member from a Career and Technical Center to each Workforce Development Board. House Bill 522, which would create a CTE investment incentive program, including tax credits for contributions to support CTE programs and enrollment expansion programs. Helping Pennsylvanians cut down on the number of telemarketing calls they receive is the goal of House Bill 318, which was passed by the House this week. The bill gives Pennsylvanians the ability to sign up for the state’s telemarketing “do-not-call” list without requiring them to re-register every five years. Residents can continue to do their part to ensure their voices are heard by visiting www.PAGOPPolicy.com and sharing with the court how such a rule change could impact their health care.